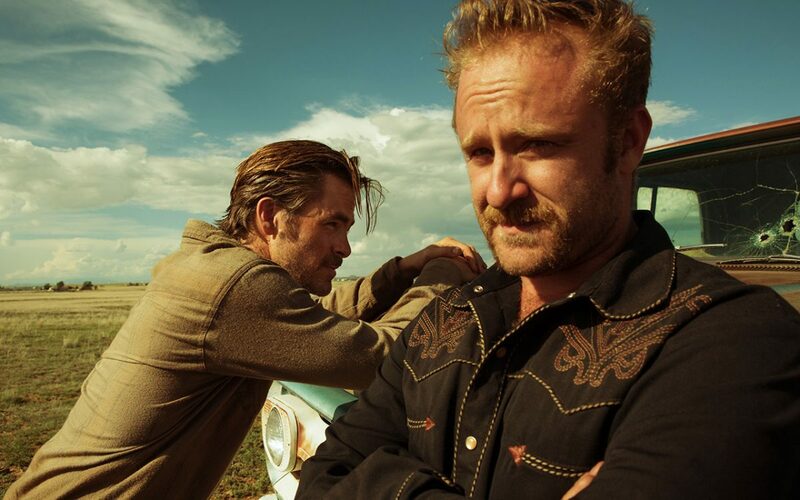 A breath of fresh air in a mostly disappointing summer movie season, Hell or High Water thrills with a slow-burn drama filled with captivating characters and intense action similar to films like Drive and Sicario. Brothers Toby and Tanner Howard bring a hell storm to the banks of West Texas in this slow-burn drama by director David Mackenzie. Hell or High Water details the desperation of blue collar America in the midst of its current financial struggles. Rather than take a broad approach, writer Taylor Sheridan (who also wrote the amazing Sicario) brings us a small western drama as small as some of the towns in Texas itself. The story focuses on the robberies orchestrated by Toby (Chris Pine) and Tanner (Ben Foster) as they try to take revenge on the bank that is currently foreclosing their valuable Texas property. Their exploits seem amateurish at first, but as the story evolves, you learn that the brothers are much more intelligent than suspected. Deputy Marcus Hamilton (Jeff Bridges) isn’t fooled by their unorthodox strategy and follows them closely with his half-Comanche partner, Alberto Parker (Gil Birmingham). If you expecting Hell or High Water to be the typical Hollywood thriller you will be extremely disappointed. What Hell or High Water offers instead, is an incredibly intricate story that is a thriller in the best sense of the word. Similar to films like Sicario, the action is raw and feels too real for comfort. Each character is in danger and that feeling is never lost throughout the film’s runtime. I’ve always known that Chris Pine was an excellent actor, but his choice in roles are of the blockbuster variety. This time, our generations Captain Kirk has ventured into unknown territory in this deeply satisfying character driven drama. Sure, seeing his charm in Star Trek Beyond is fun and inviting. Still, I feel this is the first time I see the real Chris Pine. Under all that Hollywood bravado is a talented Oscar-worthy star. Not to be outdone is Ben Foster. To be honest, I don’t think I have seen a movie featuring ol’ Ben until I realized he played Angel in X-Men: The Last Stand. This is the first performance I’ve seen of his and boy does he impress. While Pine’s character Toby is the calm and calculated type, Foster’s Tanner is the loose cannon we all love to watch on the big screen. He is like that one friend/brother that is always up to no good. No matter where you take him you know there is the possibility of things getting out of hand quickly. I thoroughly enjoyed Ben Foster’s performance and will be keeping an eye out for him in the future. Lastly, and probably my favorite character, is Jeff Bridges’ Marcus Hamilton. He plays a grizzled Texan lawman with a could-careless attitude. On the verge of retirement, Marcus initially comes across as arrogant and possibly out of his league with the Tanners. However, he very quickly proves his meddle as he leads the investigation. While Hell Or High Water has no shortage of talented actors, the real prize is the writing and cinematography. Writer Taylor Sheridan, who is fairly new on the block, also wrote one of 2015’s best films, Sicario. Sicario is a personal favorite of mine and much of what I enjoy of that film is also present in Hell Or High Water. The dialogue is witty and lean giving you just enough information to get you through the plot. There is no Suicide Squad-esque montage with information overloads. Sheridan gives each of these grizzled characters personality and realistic motive. As the story progresses, you learn so much about each character without really overdoing it. It allows you as the viewer to paint the rest of the picture and its extremely gratifying. Similar to Sicario, the setting is just as important as a character as the characters themselves. Long shots of the flats of West Texas break up the dialogue and action. In the distance you see mostly nothing except for debt relief advertisements on billboards and the encroaching amount of oil mining equipment scattered throughout the plains. The atmosphere is bleak and empty telling a story long before we meet our characters. At the end of a disappointing summer, Hell Or High Water is a welcoming introduction to a fall season filled with potential hits. Definitely go see this one.